Upgrade to FIM 2010 R2 is supported from all builds prior to, and including, build 4.0.3617.2 . To find out what build you are using, click About Forefront Identity Manager on the administrator home page in the FIM portal. It is strongly recommended that you upgrade all the FIM Server components in your environment to the same version. Mixing components from FIM 2010 and FIM 2010 R2 is not supported by the FIM product team. 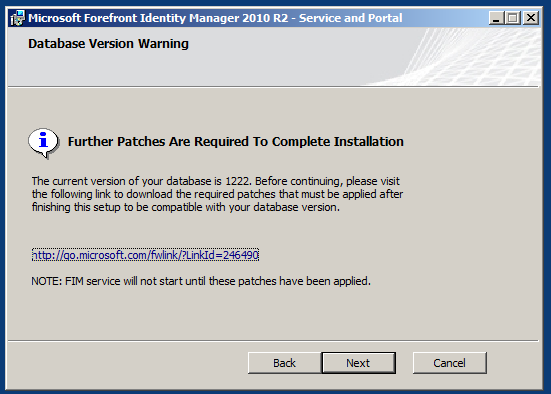 The following is the supported upgrade paths for Forefront Identity Manager 2010 R2. If you have installed the FIM Portal on SharePoint whose URL is something other than http://localhost, you will be required to upgrade to QFE build 4.0.3617.2 prior to upgrading. For information about this see KB 2688078. * Upgrading the FIM 2010 R2 RC Service and Portal is only supported for TAP customers. * Upgrading the FIM 2010 R2 RC SSPR Portals (Registration and Reset) is not supported even for TAP customers. These will need to be uninstalled and re-installed. ** If you have deployed FIM 2010 RTM from the MSDN website an in-place upgrade is not supported for the Synchronization Service. However, the database can be preserved and used in FIM 2010 R2 RTM. To do this, you must uninstall the FIM 2010 RTM Synchronization Service and then install FIM 2010 R2 RTM using the existing database. The uninstall and then subsequent install of the FIM 2010 R2 Synchronization Service using the FIM 2010 RTM Sync database is supported. The FIM Service and Portal can then be upgraded using the normal method. This only affects users who installed FIM 2010 RTM from the MSDN website and only the Synchronization Service. This is a known issue. 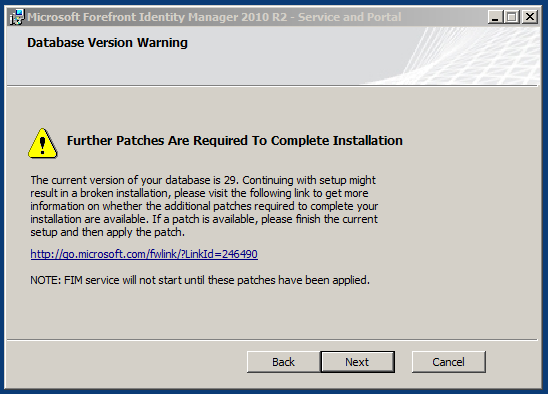 ** Upgrading Evaluation versions of FIM 2010 RTM to FIM 2010 R2 is not supported. The following are the steps required in Upgrading. For a detailed step-by-step upgrade that includes upgrading SQL Server and SharePoint see Test Lab Guide: Upgrading to Forefront Identity Manager 2010 R2. The estimated time is based on internal Microsoft upgrades. (Optional) If you are upgrading the Service and Portal Language Packs, you need to backup any customized RCDCs prior to upgrade (see Backup all Resource Control Display Configuration (RCDC) Objects). For a list of service accounts that may be required, depending on the server components that are to be installed during upgrade, see Service Accounts earlier in this document. The following are considerations that must be taken into account when upgrading to FIM 2010 R2. These considerations are general things that need to be taken into account. If the directory you selected for extracting the product files is deep in the folder hierarchy, the total file path can exceed 255 characters. Extraction will fail with the message, "Can't create output file." To avoid this issue, select a short path name to the extraction directory. Users attempting to upgrade from FIM 2010 RTM QFE 4.0.3576.2 to FIM 2010 R2 while using the "Reuse Existing Certificate" option may experience the error "Service 'Forefront Identity Manager Service' (FIMService) failed to start. Verify that you have sufficient privileges to start system services." If you encounter this error, re-run setup with the "Generate New Certificate" option selected in the Service and Portal setup. Issue a new certificate with the name ForefrontIdentityManager as the subject. On FIM 2010 (not FIM 2010 R2 ), run a re-install in Change mode. Point to the new certificate. Run the FIM 2010 R2 upgrade. The following are considerations that must be taken into account when upgrading to FIM Certificate Management 2010 R2. These considerations deal strictly with upgrading. If you have a large database and configure the recovery mode for Full, it is possible that the database upgrade will fail due to the transaction log becoming full. In this case, the upgrade will be rolled back with an error message indicating the transaction log is full. Set the recovery mode to Simple and retry the upgrade. During upgrade of FIM Synchronization Service from FIM 2010 to FIM 2010 R2 you will see a popup asking you to manually remove the MAdata folder. This popup should be ignored and the MAdata folder should not be removed. When installing FIM 2010 R2, the database upgrade scripts will delete all existing objects within the FIM owned schemas, (stored procedures, functions, etc...), with the exceptions of the tables themselves, and will replace them with the FIM 2010 R2 versions. If you've added your own stored procedures or functions to the FIM owned schemas, they will be deleted. If you have already upgraded Window SharePoint Services 2007 to Microsoft SharePoint 2010, and then attempt to upgrade FIM 2010 to FIM 2010 R2, you may encounter the error “The SharePoint Timer Service is not running.” To resolve this issue, it is recommended that you upgrade to FIM 2010 Update Rollup 2 (build 4.0.3606.2)( or later before attempting to do a major upgrade to R2. If you have not yet upgraded Window SharePoint Services 2007 to Microsoft SharePoint 2010, but plan to, first upgrade FIM 2010 to FIM 2010 R2, and then upgrade Windows SharePoint Services 2007. Log on the FIM Portal server. Click Start, select Administrative Tools, and then click Services. This will open the Services MMC. On the right, scroll down to the SharePoint Administration Service and verify that it is Started. If it is not Started, right-click on SharePoint Administration Service and select Start. Once it starts, close Services. 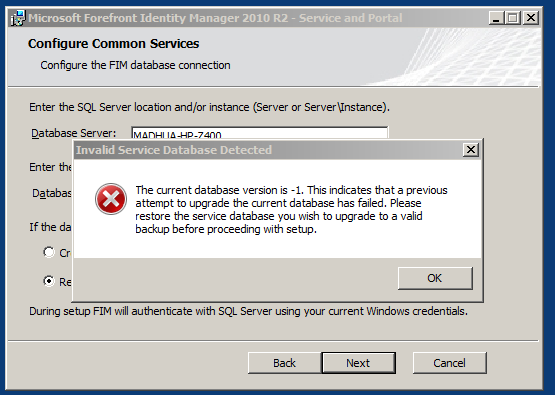 When upgrading to FIM CM 2010 R2, the server should always be upgraded first and then the clients. The older clients will work with the newer version of the server but newer clients will not work with an older version of the server. Therefore, it is imperative that the upgrade be done in this order. This is the only supported method of upgrading. If you are upgrading from CLM 2007 and want to upgrade to FIM CM 2010 R2, then the CLM 2007 server must first be upgraded to FIM CM 2010 RTM (build 4.0.2592.0) and then it can be upgraded to FIM CM 2010 R2 (build 4.1.2273.0). This is the only supported upgrade method. Upgrading from CLM 2007 directly to FIM 2010 R2 is not supported. Is Upgrade to R2 RTM supported? When you upgrade from FIM CM 2010 RTM (build 4.0.2592.0) to FIM CM 2010 R2 RTM (build 4.1.2273.0) in a topology including a separated sub-CA, and the sub-CA upgrade is done before the FIM CM 2010 RTM server, the FIM CM database is not updated with the new version of FIM CM exit module for the sub-CA . As a result smartcard operations fail for profile templates that include certificate templates of the sub-CA, with error "The version of FIM CM Server [4.1.2273.0] does not match the version of the FIM CM CA Exit Module [4.0.2592.0] installed on the CA [the_name_of_Sub-CA]". This is because the way CA registration works is once Certificate Services starts, the FIM CM exit module will attempt to connect to the SQL database and register itself. It will attempt to write it’s version number to the database. The reason it fails, in this case, is because FIM CM 2010 RTM doesn’t have that particular stored procedure. Once you install FIM CM 2010 R2 on the server and restart certificate services on the sub-CA it will work correctly. The following procedure details how to backup the FIM Synchronization Service Server Configuration. Click Start, select All Programs, click Microsoft Forefront Identity Manager, and click Synchronization Service. This will bring up the Forefront Identity Synchronization Service. 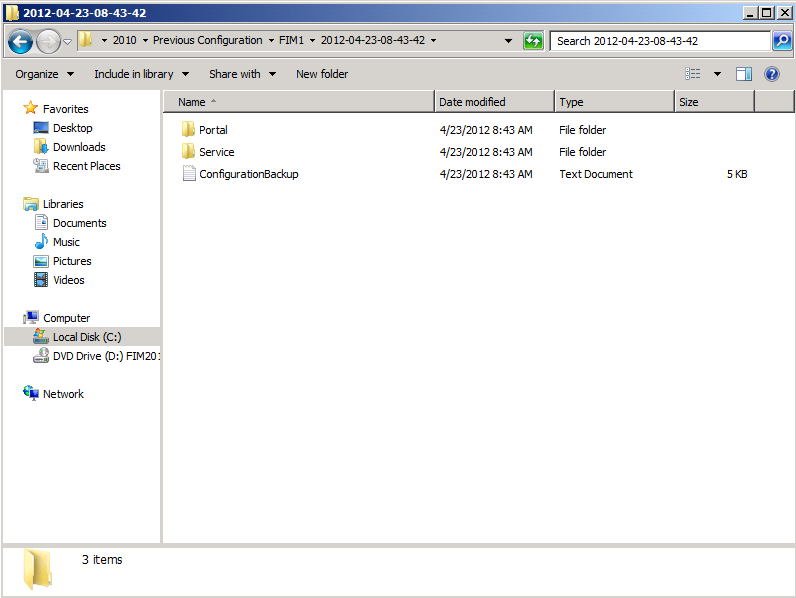 At the top, click File and select Export Server Configuration. You will be prompted with a window that says not to run any management agents or modify the server settings. Click OK. This will bring up a Browse For Folder dialog. Navigate to a directory to save the configuration. Click OK.
Once this has completed, click OK. 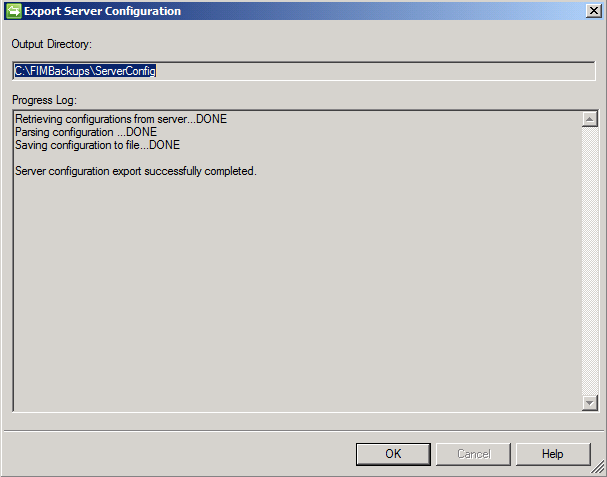 The following procedure details how to backup the FIM Service Configuration using the new Configuration Backup Tool. Be aware that this occurs automatically when doing an upgrade to FIM 2010 R2. Log on to the FIM Service server. Type Microsoft.IdentityManagement.ConfigurationBackup and hit enter. This will begin the backup. Once this completes, navigate to C:\Program Files\Microsoft Forefront Identity Manger\2010\Previous Configuration\FIM1\(today's date and time) or (current timestamp)\ and notice the Portal, Service folders and the ConfigurationBackup text. Copy the folder with the today’s date to a safe location. 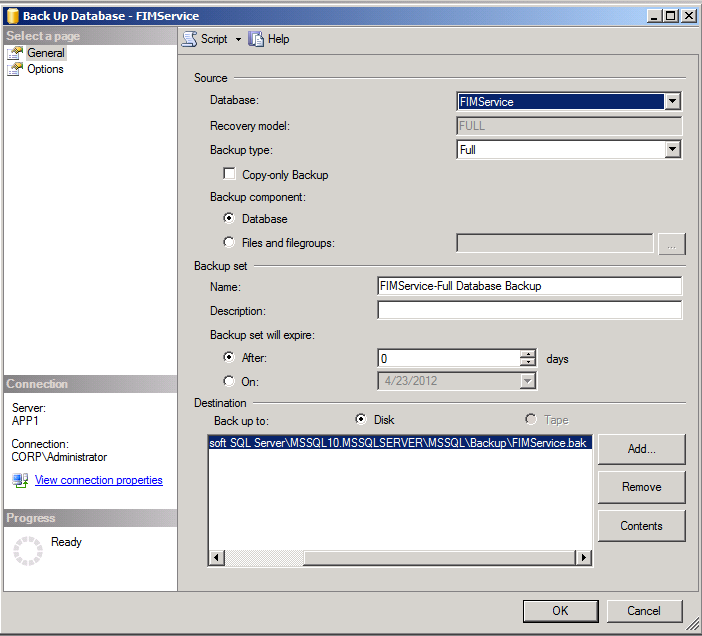 The following procedure details how to backup the FIM Synchronization Service and FIM Service databases. You may need to work with your SQL Administrators to make this happen. Ensure that nothing is running on the FIM Service Server or the FIM Synchronization Server prior to backing up the databases. Log on to your SQL Server. This may be separate servers if the databases reside on different servers. Click Start, click All Programs, click Microsoft SQL Server 2008, and then click SQL Server Management Studio. This will launch SQL Server Management Studio. On the Connect to Server dialog box, under Server Type select Database Engine. On the Connect to Server dialog box, under Server name select APP1. On the Connect to Server dialog box, under Authentication select Windows Authentication. Click Connect. This should be successful and the database information will be displayed on the left. The SQL Server Agent should have a green arrow. On the left, expand Databases, right-click FIMService, and select Tasks, and the select Back Up…. This will bring up the Backup Database - FIMService screen. Once this has completed you will see a window that says the backup was successful. Click OK.
On the left, under Databases, right-click FIMSynchronizationService, and select Tasks, and the select Back Up…. This will bring up the Backup Database - FIMService screen. Copy FIMService.bak and FIMSynchronizationService.bak to a safe location. An upgrade (or patch) of the Forefront Identity manager Language packs overwrites the Resource Control Display Configuration (RCDC) objects in the database. Due to this, customers can potentially lose all their customizations to localized strings used on the FIM Portal. If you have customized localized resources on your FIM Portal, you must follow the guidelines in this document to make sure you don’t lose your customizations. $fileName = $rcdc.ResourceManagementObject.ObjectIdentifier.Substring(9) + ".xml"
This script backs up all the ObjectVisualizationConfiguration objects as XML files which are exported by FIM Automation cmdlets. There is a file created for each object and the name of the file is the Object Identifier (GUID) for the object. Use this parameter to specify a custom backup folder. This parameter is optional. The script must be run by a user with administrative rights. The script must be run on a computer running the FIM service. The script must be run by a user that has write permissions to ConfigurationBackupPath. If any of these conditions are not satisfied, the script stops and an error is displayed. Once you have backed up these resources, you may proceed to upgrade / patch the FIM language packs. When the upgrade completes, you will no longer see your localized customizations on the portal. The following steps describe how to bring your customizations back from the backed up resources. When the cmdlet finishes, the object represented by <GUID> is imported into your database, and carries the changes that you had made previously. Repeat steps 2 – 4 for each object that contains customized localization data in it for your portal. For additional information see Compare-FIMConfig cmdlet. For additional information see Import-FIMConfig cmdlet. This section outlines problems that can be faced during an upgrade of the Forefront Identity manager – the database upgrade step. It also outlines what needs to be done in these cases. The Forefront Identity Manager 2010 (FIM) R2 supports an upgrade from prior versions of the product (e.g. FIM 2010 RTM). An upgrade to FIM 2010 R2 is a ‘major’ upgrade. The older version of the product will be uninstalled before installing the new version. Since the FIM Service and FIM Service Database are tied to each other, it is necessary that the version of the FIM Service Database be the same as the version that the FIM Service expects to work with. If the upgrade of the FIM Service Database fails during setup, it will cause a rollback of setup and may leave the FIM Service Database and FIM Service in an incompatible state. Database version is unknown to setup to upgrade from - this will happen when your current database is the result of applying a Hotfix / Update to your current product that was released before the latest version of the product was released.